I figured, the easiest way to identify all of the VMs that are using VMDKs on multiple different datastores was PowerCli. The result – just a one liner. Ken Gottleib, the Principle Virtualization Consultant at Winchester Systems, Inc. USA recently posted the following very useful bit of info over on the VMWare communities site. I quickly dropped him a note and asked for permission to duplicate his work, as I have had this same issue before and never documented the process properly. The source you are looking to migrate (with this method it is actually a copy which is good, because the source is always left intact) can be a virtual disk, virtual rdm, or physical rrdm, it doesnt’ matter, you will always use the servername_x.vmdk file as the source in the command string you are about to see… but before I continune, if you want to migrate from physical compatibility mode lun to a new physical compatibility mode lun, be sure to have provisioned the lun so ESX can see it. If you are to convert the physical mode RDM to virtual RDM, the same applies. If you are to convert it to virtual disk, just be sure you have a vmfs volume with enough space to accomodate the new disk. – in vi client edit VM settings of powered down VM, remove rdmp mapped disk, then re-add a new hard disk selecting the same disk only be sure to select virtual as the mode, you will log in and see all of your data and mount points are unchanged. the servername_x.vmdk is the source, the x will stand for the order of the device, in my example I use 1 which means this is the second disk on the VM. the first disk file is servername.vmdk, this is typically always the system disk. the /vmfs/volumes/vm folder/servername_1-rdm.vmdk tells us the location of where to store the raw disks mapping file, I have chosen to put it in the virtual machine folder as you can see, you can put it on any vmfs file system, I like to keep things neat and clean. Ever needed to copy data from your local machine to a VMware datastore . .and not felt like messing around with winSCP / FastSCP, the Datastore browser etc? Of course this gives you full access to all of the datat on your datastores directly form a PowerCli session, so you can run any sort of reports / inventories etc that you may need. Happy days . . Setting up of this is quite simple. 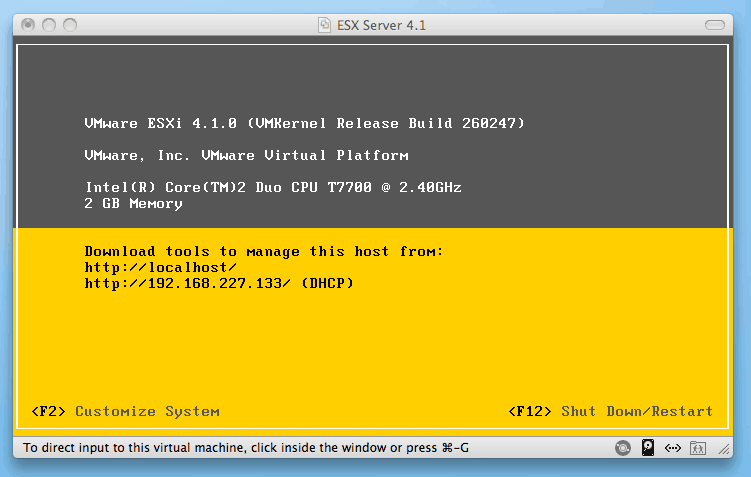 If you want to run this on ESX / ESXi, you’ll need to convert the vmdk from workstation to ESX / ESXi. 3.3.1. vmkfstools –I ./Eda-v0.94.vmdk ./Eda-v0.94_new.vmdk (Interestingly, this changed the size from 407MB to 1048MB ? For 0.94 To import the host to VC was now as simple as right clicking the .vmx file using the datastore browser / local browser and selecting ‘import’ then following the wizard. (I know I could have done this from the command line, I was lazy) (If you’d gotten a version that had an OVF file, you’d simply need ti use the ‘Import OVF’ wizard for this) – 0.94 has been configured as an OVF(appliance) , so you can import it the same way all appliances are imported. Click on reconfigure to edit the network settings (this will be the IP for the appliance and the web URL you’ll use to do further configuration) – Fill in you information and click on OK to save the settings. 15.3. Run a manual installation. As the objective of this exercise is zero / limited touch installation, we are going configure / prestage settings for a host. If you were to PXE boot a host to your EDA now, you’ll see this host appear. While we are looking at this appliance. We can see that the beautifully (simple is beautiful as far as I am concerned when it comes to techie interfaces) has several additional options available, so let’s explore what we can get out of the enhancements. 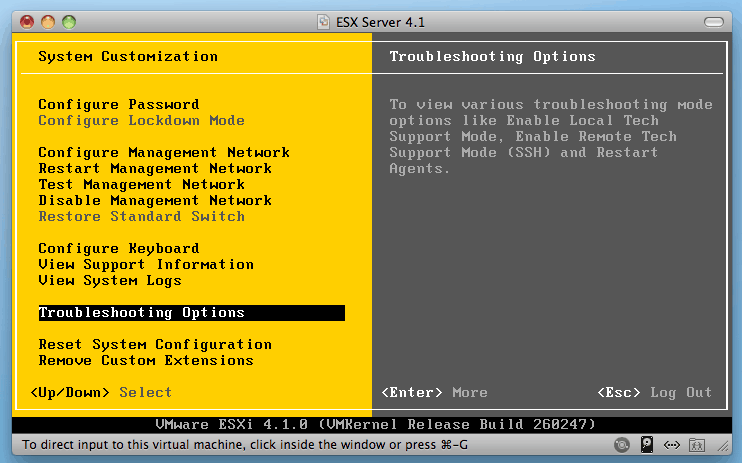 Firstly (from the above screen grab of the full web interface), we can see a ‘General ESX host settings’ tab. This pretty much speaks for itself – we can specify the Netmask / gateway / nameserver / licenseserver (older ESX hosts) ksdevice(in case we want to drop kickstart files), an latered root password (obfuscated of course) and a timezone – that’s a bunch of nagging keypresses. Even better, on the right, we have a block called ‘Post Installation Commands’ – what this basically does is allows us to build some scripts to execute at the end of our source build going down. For example, we may choose to configure our NTP servers or create a user. To do this, we simply select ‘Configure NTP’ from the dropdown and click the ‘ADD Button’ – the base code is generated and copied into the text box beneath – all that we need to do is edit the bits that are added below (Generally, it will be strings like XXXXX, or YYYYY that need to be modified) – A little vCli knowledge would be handy here as you can append any addition changes that you would like added, simply by modifying the text in the box. All you will need is in here: http://www.vmware.com/pdf/vsphere4/r41/vsp4_41_vcli_inst_script.pdf – though the generated script blocks on the appliance should be enough. I added several config settings on the rights and then dropped a PXE boot build on a new ESXi server and was surprised, even astonished at how smoothly the build went. Simply edit the timeout value to what you need (it appears that the values are 10ths of a second – so timeout 100 = 10 seconds) – again, you can make all manner of changes to this if you like (most of the PXE config is in /var/lib/tftpboot) – as it is just one of the basic linux boot disks, just have a look here: http://syslinux.zytor.com/wiki/index.php/The_Syslinux_Project Ideas include adding your own logo, adding additional boot option, possibly some integration with other systems etc – maybe even (if you really felt like it) some Mac Address detection that allows for a stateless installation for each host at boot time – meaning that you could simply change the Mac Address on the appliance for a new ESX host and lay that image on a new host, if an old one failed? Or even a forced install on any host that has no drives configured? Modified ISO : About 3 minutes per ESXi host, but you’ll need to replace upgrade the install.tgz file each time you upgrade your ISO. Being able to create custom postbuild scripts is awesome – but not all my ESX hosts are in the same location / cluster etc – it would be nice to be able to store a customisation with each ‘new host’ that is unique to that host – modifying postinstallation tasks seems to edit all ks files for all hosts that I have created (or it could just be me being stupid) – I will persist and possibly post a comment on the VMware community thread. There are several tools available for quickly deploying ESX / ESXi ( I am reviewing these in my ESX to ESXi ‘Upgrade’ series. But the vanilla config for each of these still requires a coule of manual key presses – ting is, do we really need a welcome screen and a second confirmation of everything we do? Assume for example I have 20 ESX hosts, ready to build, but networking is not yet in place because as usual the Networks team are dragging their heels . .so I decide to take the 20 boxes and drop ESXi on them. I am happy (in this case) to ISO boot them, but do not want to click ‘Next -> Next -> Next -> Next -> finish’ (If I wanted to do that I would have installed Windows? Anyway, the way to modify this is to crack open the python script that VMware uses for installation. The content looks like this: If I were a gambling man I’d guess that we need to modify the install.tgz file? OK, so as we are doing this from within Ubuntu, we could simply double click the file and extract it, but I am going to assume that you may only have a shell from your Linux (or you’re using something like Cygwin) – so let’s open a terminal shell. About 20 lines into the file you will find a class called ‘ThinESXInstall’, we need to edit the steps in this section. Once you have edited this as you like, simply hit CTRL – X and when prompted select ‘y’, then save the file back to the original location. We now need to rebuild the install.tgz – at the terminal shell we type ‘cd /tmp/install’ then ‘tar –czvf /tmp/install.tgz *’ – this will create a new tarball at /tmp/install.tgz. YOU HAVE DONE THIS IN THE TEMP DIRECTORY – IT WILL BE DELETED AT REBOOT! We now have a modified install.tgz that simply needs to be replaced in our ISO. Using your favourite ISO editor (Google UltraIso 9.3 PC Users readers) simply replace the old install.tgz file with your new one. If you now boot from the ISO (or even use it with one of the various PXE server solutions out there (UDA / EDA / V-PXESEERVER etc) – you will suddenly have a bunch fewer prompts at boot. Happy days . . enjoy! In my ESX to ESXi upgrade, I’ll look at a few tools for hands free installation, first in the series is V-PXEServer – This is a simple WinPe boot disk that effectively hosts TFTP, DHCP and PXE. Simon Long’s blog has installation instructions and has done a really good write up on the deployment process. In addition, he has added some handy customisations like speeding up the deployment and providing customised company backgrounds etc while the process runs – though it appears that the author of the appliance has made changes to the build as it now seems to deploy in about 5 minutes, where Simon was getting 15 minute deploy times.